People regularly ask me for restaurant recommendations for a birthday or romantic date in Jerusalem, or w hat my favorite eatery is. But I almost never answer, or give them the answer they’re looking for, for two reasons. Firstly, I cook at home much more than I eat out, and secondly, when I do go to a restaurant, it’s usually a casual place, where I can enjoy a plate of simple, delicious food day or night or pick up something to take to work or on the go. So, if you really want to know one of my favorite places to grab a bite to eat in the capital, it’s Village Green, a buffet cafeteria-style vegetarian health food place with two locations in Jerusalem. Sounds intense, but it’s delicious! The focus point of the restaurant is the self-service hot and cold food bars: A extensive salad bar with top-quality Israeli vegetables and toppings, plus a prepared food section with roasted regular and sweet potatoes, baked tofu, stir fried seitan, vegetables, lentils and various grains like wild rice, quinoa and others depending on the day. Help yourself to anything before your plate is weighed and priced. It is 8.5 shekel per 100g , but since I’m guessing that means as much to you as it does me: I generally pay around NIS 40 for my overfull plate. The only downside is that the hot food isn’t generally particularly warm, and though they’re happy to heat it up for you, you can’t then mix up your lettuce and tofu. 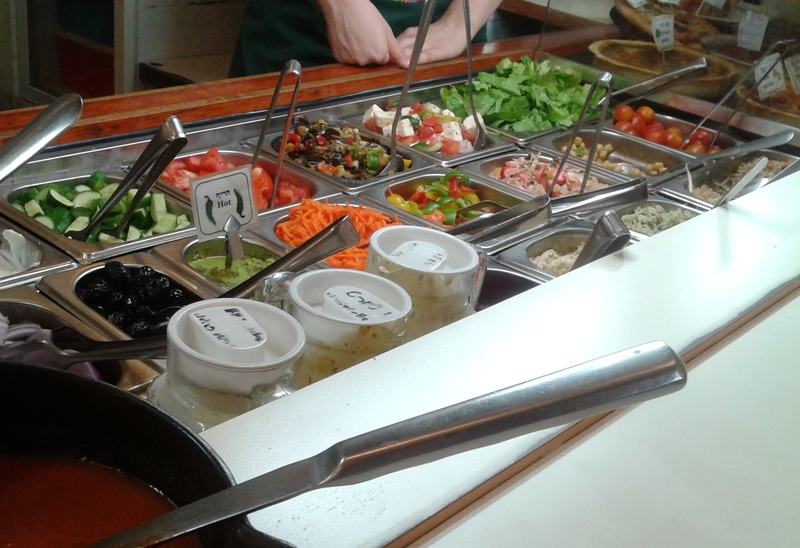 Aside from the self-service food, both locations offer a wide variety of excellent soups, from cream of butternut squash to Indian lentil, cream of broccoli, tomato rice or split pea barley, for NIS 30 a bowl. Plus several types of quiche, pie, lasagna and stuffed vegetables are available. In case you thought a health-food place would skimp on dessert, think again. 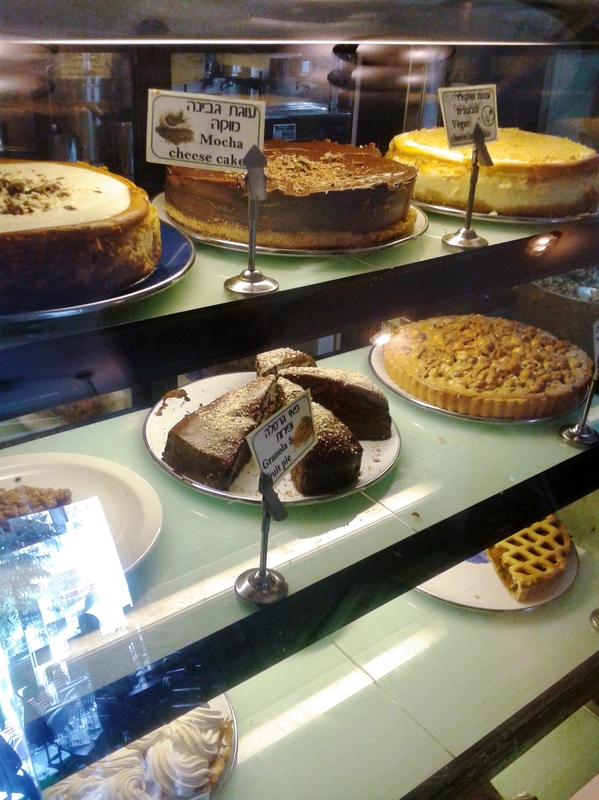 Village Green’s cheesecake is one o f the best in the city, and they also offer pies, gluten-free chocolate cake as well as low-fat muffins and sugar free desserts. In case that wasn’t enough, you can get several freshly squeezed juices and milkshakes as well, plus the typical coffees, beers and lemonade. Their two locations are centrally located – one just off Emek Refaim Street in the German Colony and the other a block from Kikar Zion on Ben Yehuda Street on Yaffo. 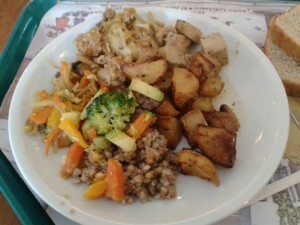 You're bound to stumble past them at some point in your travels, so cast your tofu-aspersions aside and give it a try! 33 Yafo Street and 5 Rachel Imenu Street.